I love languages despite the fact that I can only (and barely) reliably speak one. Kohupiimaküpsised translates as cheesecake (or curd cake) on Google Translate. To me that is wonderful, but totally inaccurate! They are actually more like an American biscuit than a cake. I think this has to do with the fact that “England and America are two countries separated by a common language.” I am going to attribute that quote to me, as no other writer seems to want it. And it is very true. When an American says biscuit, they think of a delicious, quick bread bun, or roll. When a Brit says biscuit they think of a dessert or snack that is fairly sweet. Think of a chocolate chip cookie (biscuit), or a ginger snap, or a vanilla wafer. I am certain that the movie, “Free Willey,” caused quite the humorous stir in Great Britain, when it debuted. I saw the recipe on the blog: Estonian Cuisine. The author of this blog, KR, has an amazing talent for photography. The food is very good to begin with, and then her photos just make you want to eat what is on the screen! I do not have the same knack for photography. I think I will have to fight to make any improvements at all. Her Photos also make you want to try her recipes. The biscuits that she blogged about are made with quark, which is a kind of fermented dairy product that resembles a very thick yoghurt, or creamy ricotta cheese. They are simple to make and very flexible as far as use goes. You can make them sweet or savory. I used Greek style yoghurt because I can’t find quark in my local grocery store, and I was too lazy to make it. You need to let the whey drain off of the yoghurt before using it though. This is easy to do. Just put the yoghurt into a fine mesh strainer, or tie it up in some cheesecloth, and put it in the refrigerator overnight to drain. My first effort did not turn out well. They tasted pretty good, but they were doughy and quite greasy. I thought about this a lot, and decided that I did not execute the method well. I didn’t drain the yoghurt well enough, and I should have mixed the butter in better. I addressed these shortcomings in my second effort. I cut the butter into small pieces and then cut it into the flour with a pastry knife. Once the butter started to incorporate into the flour, I simply used the tips of my fingers to work the butter in even more. The result was a mixture that felt a bit like wet sand. Then I worked the yoghurt into the flour mixture. This produces a very soft dough. Once you have the dough mixed, it is time to roll out into a snake. The snake will be about a foot long and about 1.5 to 2 inches in diameter. This will be cut into roughly 13 pieces. Each piece should be patted out onto a floured surface to about an eighth of an inch thick. I tried to roll them out, but the dough is so soft, and, I confess to being a bit ham-handed. Then you need to fill them. 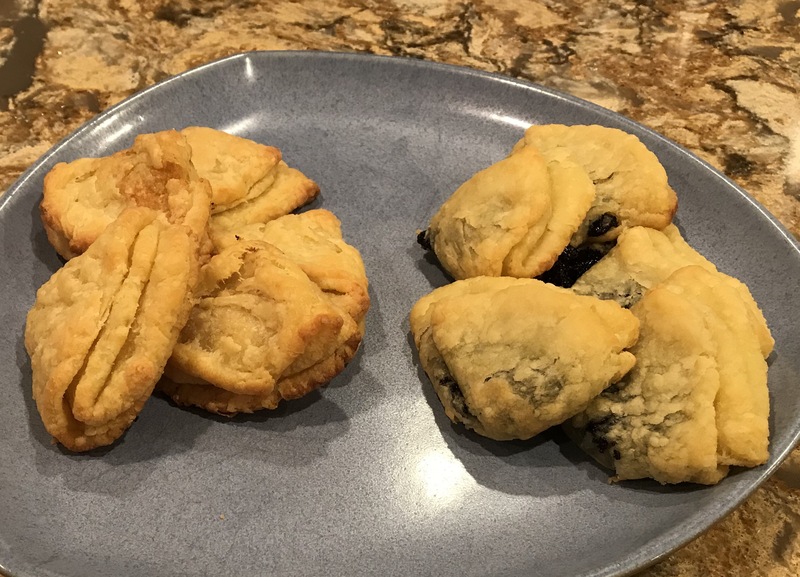 I chose to use poppy seed pie filling for the sweet filling and then used salt and caraway seed for the savory filling. I also used garlic butter in one batch. Just place about a teaspoon of poppy seed filling in about the center of the dough circle, and then spread it a bit as best you can. Don’t spread to the edges! Fold the dough in half, and then in half again. Place on a parchment lined baking sheet, or a silpat on a baking sheet. Treat the caraway/salt filling in the same way, but sprinkle it on. It takes less than a 1/4 teaspoon of salt and a small sprinkle of caraway to fill the dough. In this case, you can sprinkle a bit more salt and caraway on top of the folded biscuit. 200 grams Quark (or drained yoghurt) Drain yoghurt for 24 hours. Preheat oven to 350F convection. Prepare a two baking sheets with a sheet of parchment or a silpat. In a bowl, combine flour, salt and butter with a pastry knife until the mixture resembles damp sand. You can use your fingers to do this, but be careful to not overheat the butter. Next, mix in the quark or drained yoghurt, and combine well. Turn the dough out onto a well floured surface and roll into a snake or sausage, about a foot long and about 1.5 inches in diameter. Cut into about 13 even slices. Working on a well floured surface, pat each slice into circles about an 1/8 of an inch thick. Sprinkle filling on top of the circle of dough, then fold in half and in half again. Sprinkle additional filling on top of the biscuit. Place on the baking sheets, evenly spaced, about six or seven biscuits to a sheet. Bake for 25 minutes at 350F convection, or until just beginning to brown. Serve as a snack, or as a side dish. Thank you for reblogging my post. What an honor!